I make aval upma very often. But this vegetable poha was something which I learned from srivalli. Its very easy to make and it took just 10 mts altogether to finish the recipe. curry leaves & coriander leaves - for garnishing. Wash poha nicely and soak it in water for 5 minutes. Drain it after it becomes soft and keep it aside. In the mean time, preheat oil in a pan, splutter mustard seeds, fry urad dhall, channa dhall, green chillies & asafoetida for a minute. Add onion and saute for couple of minutes. Now add the other vegetables one by one and let it cook few 3 to 5 minutes. When the vegetable becomes tender, add the drained poha, add required amount of salt and roasted almond powder ** and mix everything well. Garnish it with curry leaves & coriander leaves. ** Srivalli has used roasted peanut powder instead of almond powder. 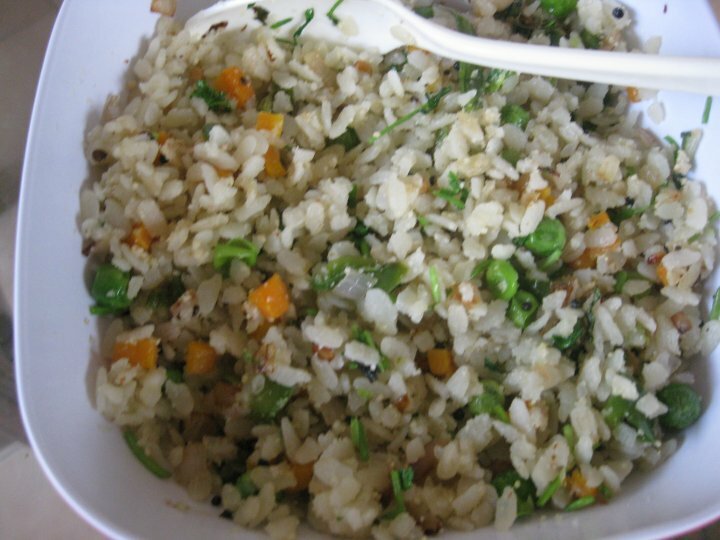 I love veggie upma too But my husband isn't that fond of it so I end up adding just onions .